Most colleges are primarily deemed as educational houses where our young men and women hone their knowledge and prepare for the real world. But did you know that some of these colleges can act as venues to tie the knot and even celebrate civil partnerships? Choosing the perfect wedding location can be a daunting task because of the sheer volume of choices at your hands. In order to find a place as special as the occasion itself, it can be helpful to think outside of traditional options. 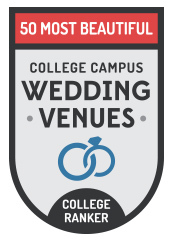 With that in mind, here is our list of the top 50 college wedding venues to keep on your radar. 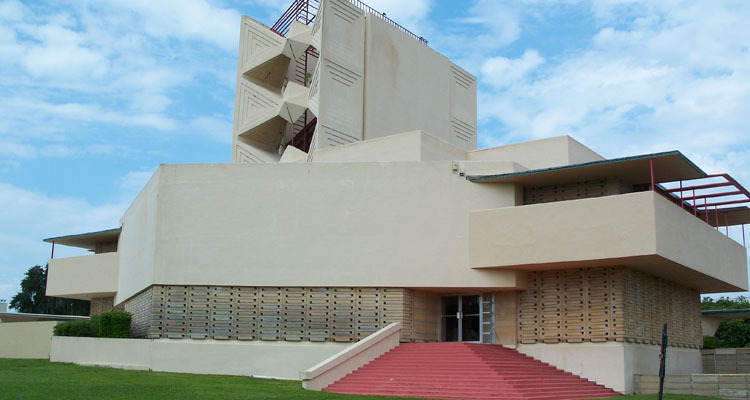 The historic Annie Pfeiffer Chapel, home to the school’s weekly Protestant Chapel Service and Catholic Mass, is the original and first-completed Frank Lloyd Wright work on Florida Southern’s campus. Dedicated in 1941, it originally acted as not only the location of campus chapel but also as the location of the college’s Convocation. The Chapel currently features theater-style seating throughout the ground floor and the balcony, a full organ, and baby grand piano. The chancel of the chapel has been extended since its original design to accommodate a wider variety of events, including wedding receptions and ceremonies. 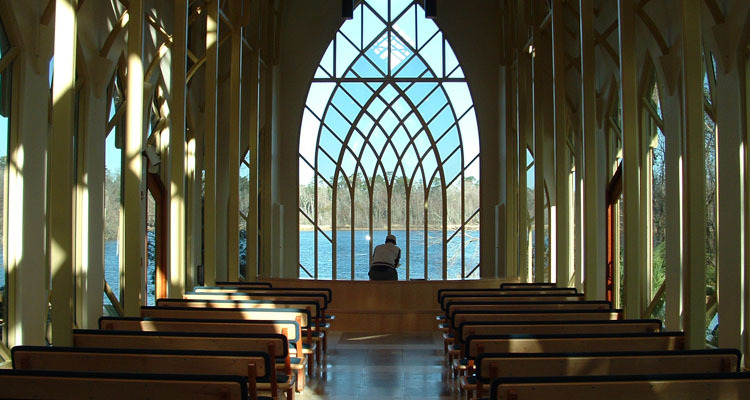 The Interfaith Chapel in Rochester is a picturesque setting on the banks of the Genesee River. It features a distinctive stained glass dome and has designated dressing areas for the bridal party and groomsmen. Including with a reservation are services from a University School of Music organist. While it’s traditional that Rochester alumni return to campus to hold their weddings here, it is also open for use by the general public. 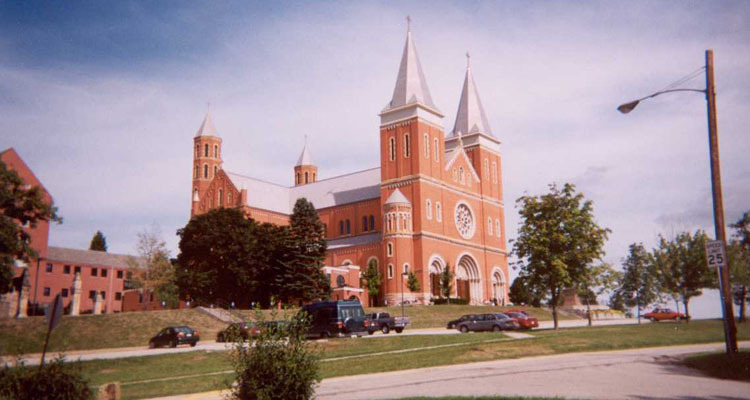 The Immaculata Parish was built in 1959 to commemorate Reverend Charles Francis Buddy. Its gorgeous statues, paintings, stained glass windows, columns, and pillars make this cathedral an eye catcher. 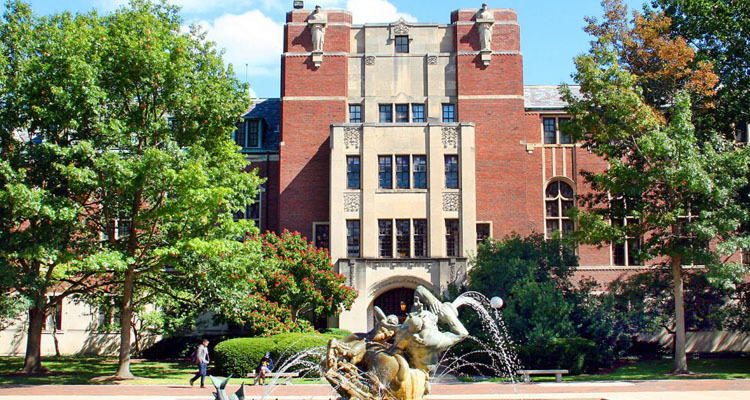 It offers the church and is open to couples with no affiliation with the University, but in the tradition of the Church at least one member of the couple must be a baptized Catholic. 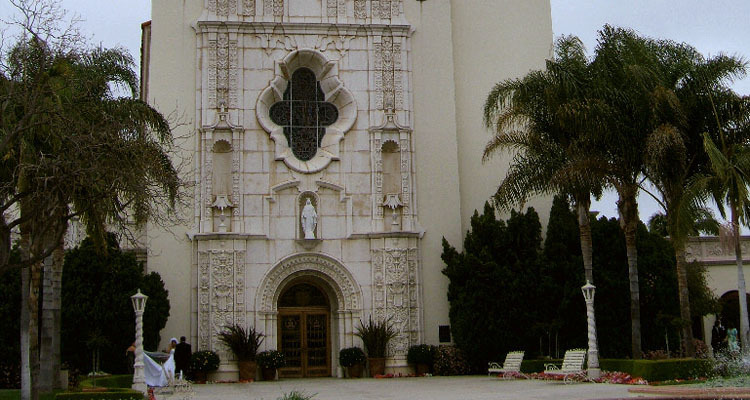 The chapel’s exterior, done in the Northern Italian Renaissance Revival style, features red brick with limestone trim with terra cotta and bronze ornamentation. 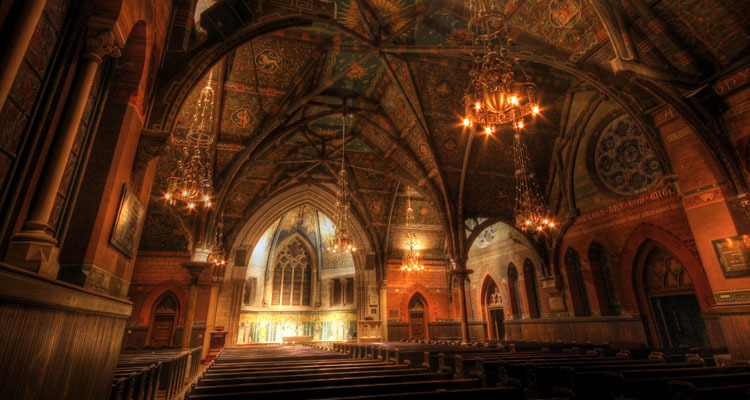 The chapel’s Byzantine interior features Guastavino tile vaulting in intricate patterns on almost every curved surface. The chapel has sonorous acoustics and its Aeolian-Skinner pipe organ is renowned for its fine tone. The venue is open to everyone irrespective of denomination or faith. It is used both for ceremonies and as reception facilities. 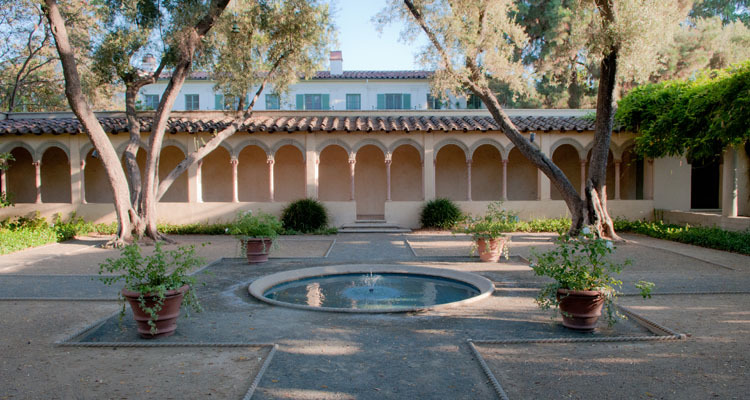 Margret Fowler Garden’s western area features a central pool and four walkways broadening out into cardinal directions, similar to Christian monastery and Islamic courtyard gardens that animate the Garden of Eden. 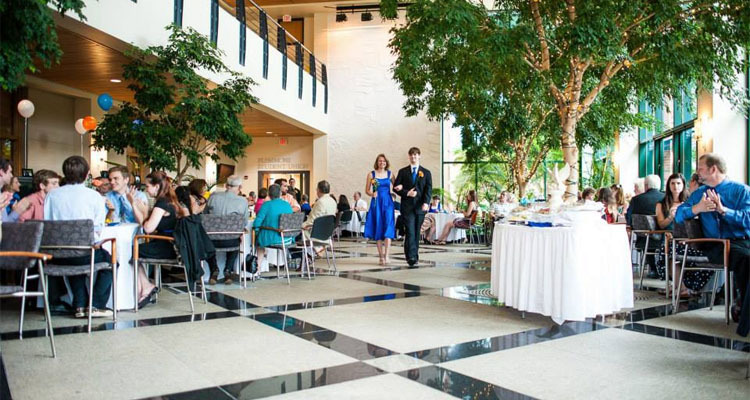 The eastern side has a Mediterranean-style tiled wall fountain and an open flagstone space for receptions. Originally planned in the European medieval-style, this area was to be a cloister garden located east of a proposed chapel. Colonnades from the north and south sides of the chapel were constructed to direct guests to the Oratory in the curtilage’s northeast corner. Since the college chapel was never to be, the Margaret Fowler Garden developed into a “secret garden”, a truly unique setting for your special day. 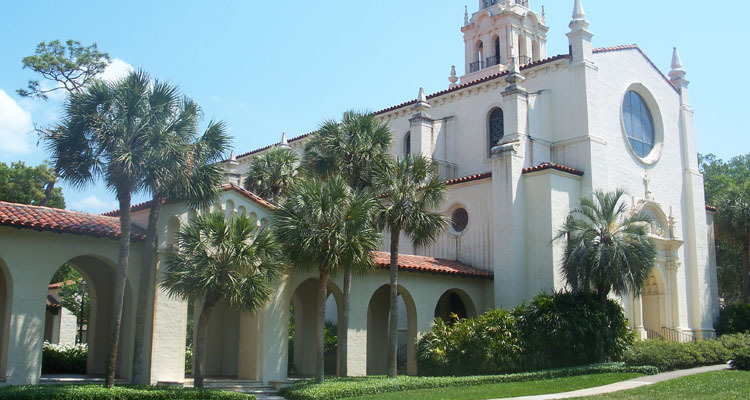 Knowles Chapel is one of the oldest and most beautiful buildings in Florida, featuring Mediterranean Revival architecture and a large stained glass mosaic overlooking the rear gallery. 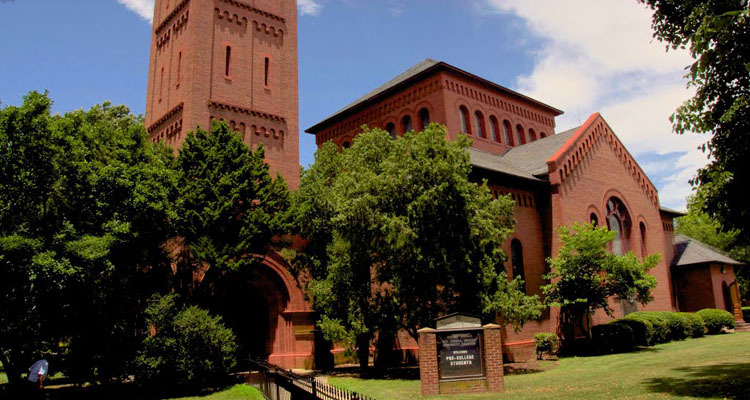 Knowles is a more exclusive wedding destination; in order to be married, at least one member of the couple must be a student, graduate, or staff member at Rollins College, or the child of one. 44. 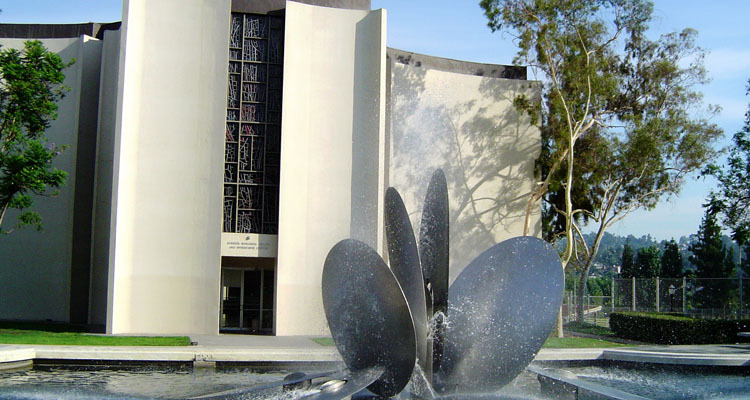 The Margaret Brown Herrick Memorial Chapel – Occidental College. 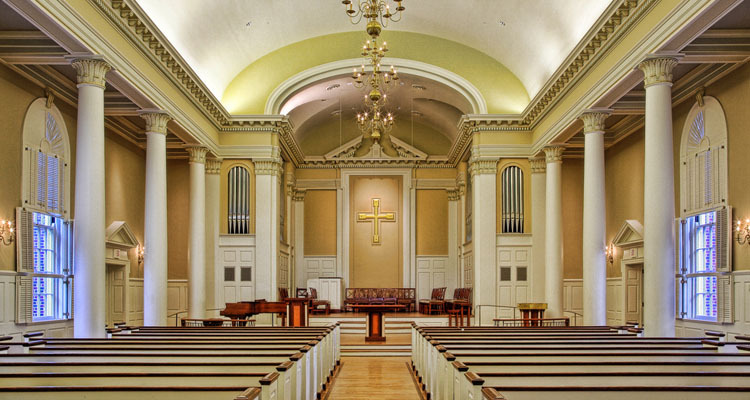 Architecture visibly symbolizes the College’s roots in the Christian tradition; Herrick Memorial Chapel is a product of the alliance between Christianity and culture in western civilization. A work of art, it meets both the practical religious needs of the community and heightens the aspirations of those who worship in it. Thereby, it adds a new dimension to the context within which education is advanced at Occidental. It offers the church for wedding ceremonies but not receptions. The newly completed Numen Lumen Pavilion was built with high consideration to environmental responsibility, including low flow toilets, use of recycled materials, and energy efficient window fixtures. The multipurpose room and two story, high windowed sacred space can be combined for large gatherings and special occasions such as weddings. The philosophy of the college is to be totally inclusive of all faiths and orientations. The College Club building itself is very nice, but the surroundings make this a dream destination for a wedding reception. The hall is set on five hundred acres of pristine woodland, and overlooks Lake Wabash. The Club is also available for special events such as bat mitzvahs or high school reunions. 41. 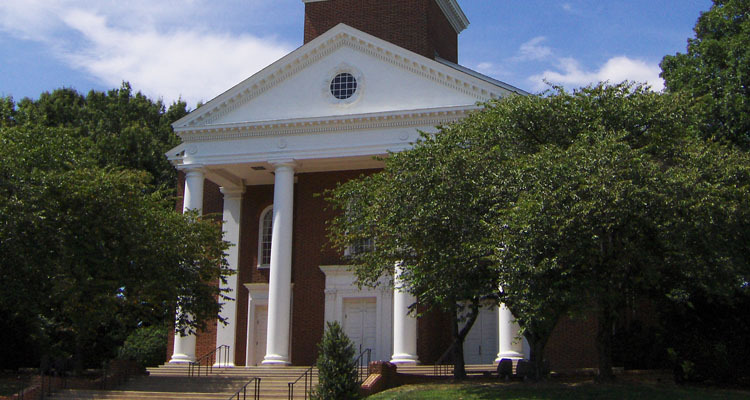 Memorial Chapel – University of Maryland. Dedicated on October 6th 1952, the non-denominational and picturesque Memorial Chapel stands in honor of members of the University of Maryland community who lost their lives serving our country in the United States Armed Forces. 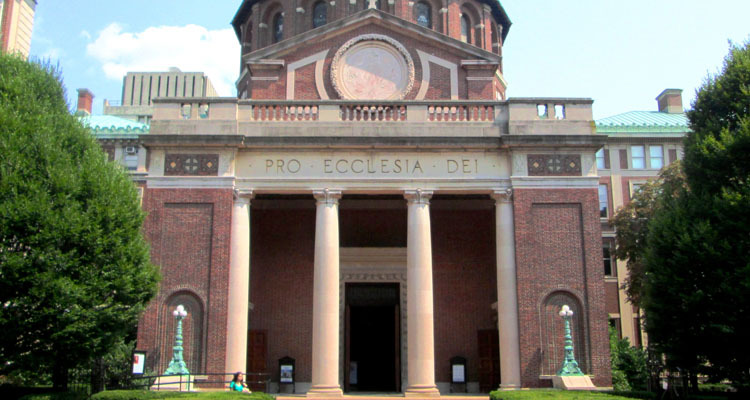 As an icon at the University of Maryland, the Memorial Chapel stands as a symbol of unity and serenity. It offers the church to be used for ceremonies and receptions by anyone irrespective of religious affiliation. The Church was built in 1886 by renowned architect J.C. Cady, and furnished with yellow pine pews designed by students of the University. Built in the Italian-Romanesque style, it is one of six historical landmarks on the Hampton campus. While Hampton is historically a black university, the Chapel is open to people of all backgrounds and religious affiliations. 39. 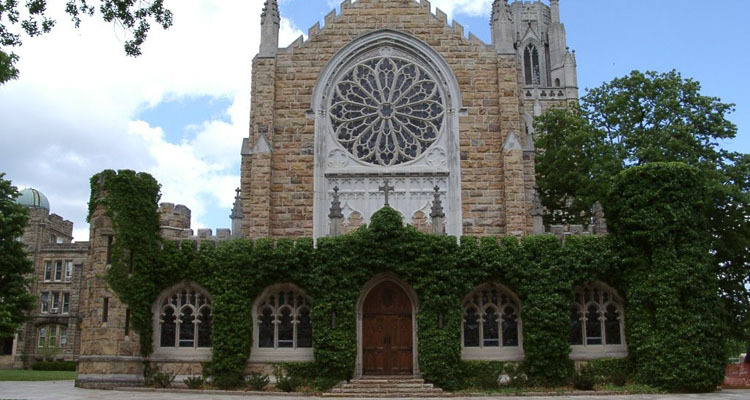 All Saints’ Chapel – Sewanee: The University of the South. All Saints’ Chapel is the official chapel for the University of the South. The building of the chapel was filled with stops and starts, and took over 100 years before finally being completed in 1959. As wedding goers can attest, the venue was worth the wait. The design of the church was created by Ralph Adams Cram in 1904, but wasn’t used until a Vice-Chancellor pushed for the completion of the chapel to commemorate the school’s 100 year anniversary. Cram was inspired by numerous architectural masterpieces, and it clearly shows. It offers the church to be used by Sewanee alumni, enrolled students, and staff, as well as members of the community of faith with approval by the Chaplain. It’s used for Christian religious wedding ceremony only. The Jefferson Ballroom, the Hall’s main reception area, is joined by a terrace with a brick and slate patio, as well as an outdoor bar. 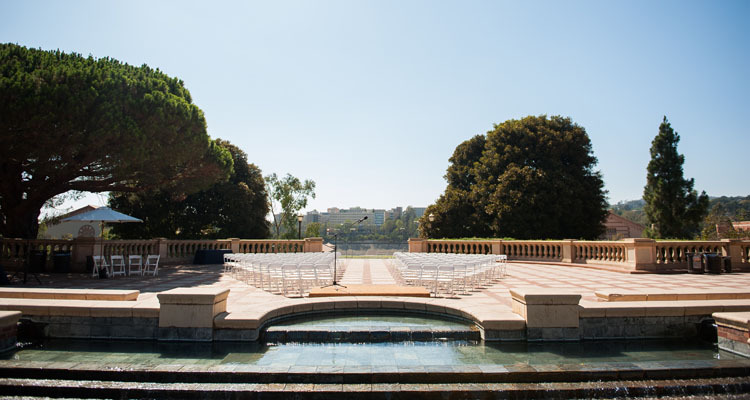 The Terrace is the perfect site for outdoor events, including wedding ceremonies, and serves as a wonderful spot for event guests to catch a breath of fresh air during ballroom events. 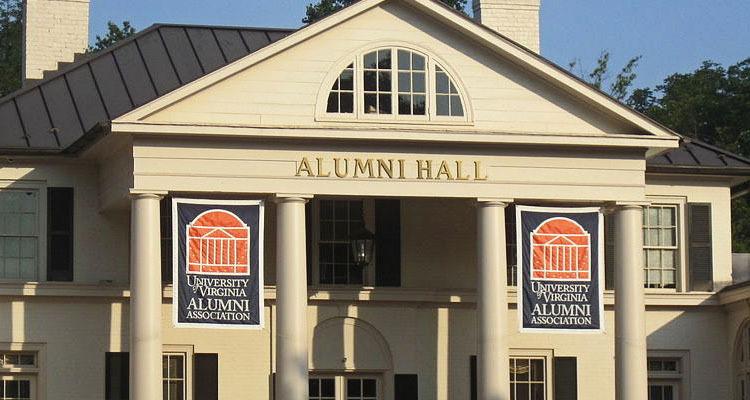 While it is primarily the wedding venue of choice for UVA grads, it is open to the general public. The Armstrong Browning Library in Waco is home to the largest collections of English poets Robert Browning and Elizabeth Barett Browning. 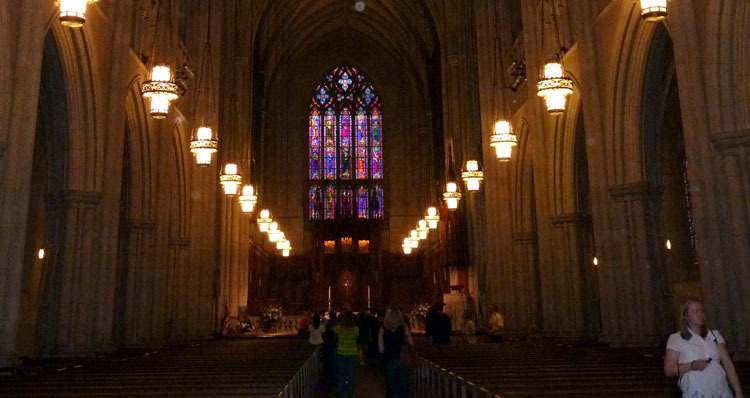 It is also said to accommodate the largest collection of secular stained glass in the world. It can be used by Alumni, enrolled students, and the full-time faculty and staff. Any library patron who has donated an amount of at least $5000 a year can also claim its use. Any ceremony from any denomination can be carried out in the hall. 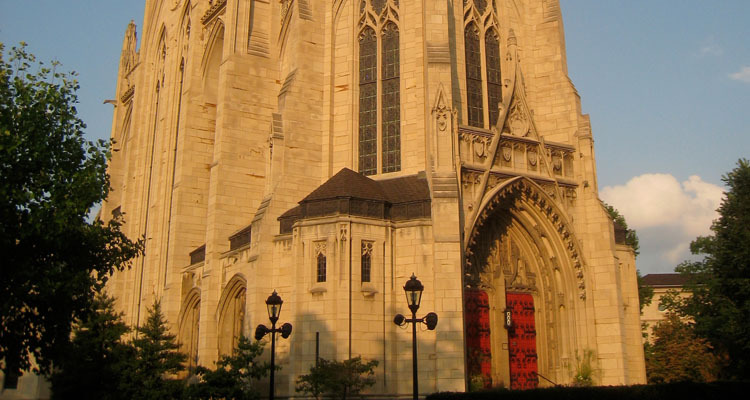 Formed prior to the Civil War, Saint Vincent is the oldest Benedictine Monastery in the United States and the largest in the Western hemisphere. Eighteen granite columns support the enormous arched roof of the chapel, which is 68 feet at its highest point. 35. Sister Mary Grace Burns Arboretum – Georgian Court University. This is a lavish country estate resembling an English estate of the Georgian period; therefore, it was named Georgian Court. 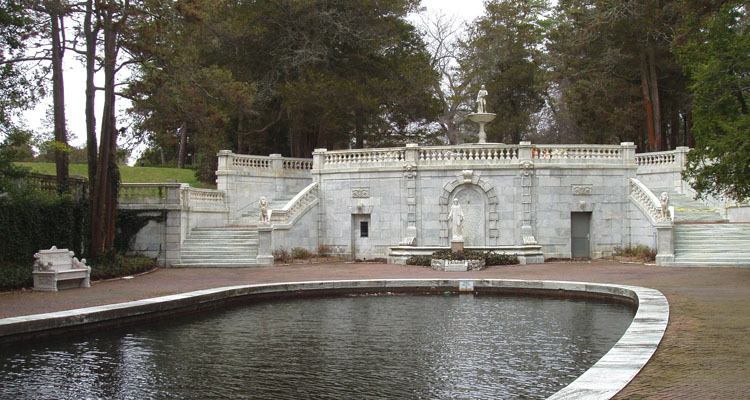 In addition to designing the buildings, Bruce Price designed three of the four historic gardens: the Classic or Italian Gardens, the Sunken Garden or Lagoon, and the Formal Garden. The garden designer Takeo Shiota designed the Japanese Garden. It offers the church to be used strictly by Georgian Court alumni, enrolled, and full time staff irrespective of their denomination. It is mainly used for ceremonies. 34. 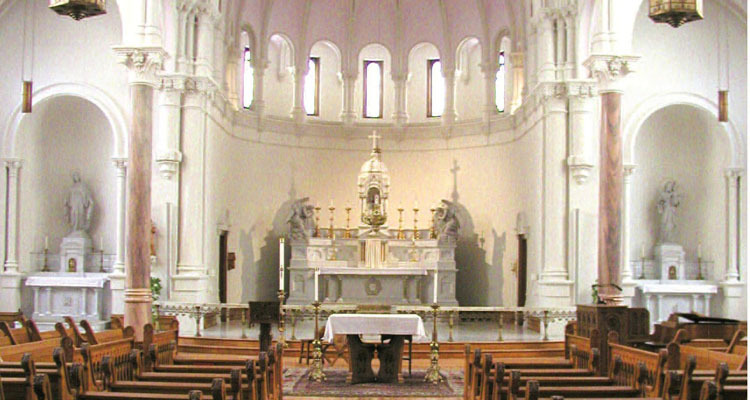 St. Joseph Chapel – Seton Hill University. Saint Joseph Chapel, “the heart of Seton Hill,” with its pillars of rose Georgian marble, intricately sculpted high and side altars of Carerra marble, 18 stained glass windows (including two 16 foot rose windows and a circular angel window in the ceiling above the altar) and hand carved wooden pews, was dedicated on November 18, 1896. It offers the church to be used by alumni, enrolled and staff only. It is used for Roman Catholic religious wedding ceremony only. Vassar Chapel was built in 1904 and is the main religious building at Vassar College, and is the largest religious edifice in Poughkeepsie, New York. It is one of the few buildings at Vassar that has not undergone considerable renovation. Architecturally, the style of the building is Norman, and is constructed from ‘seamed’ Cape Ann granite with sandstone trimmings. It offers the church to be used in events and is mainly used for ceremonies. Duke Chapel in Durham features Collegiate Gothic style, characterized by large stones, pointed arches, and ribbed vaults. It also has a 50-bell carillon and three pipe organs, one with 5,033 pipes and another with 6,900 pipes. 77 glass windows are all stained with different designs. 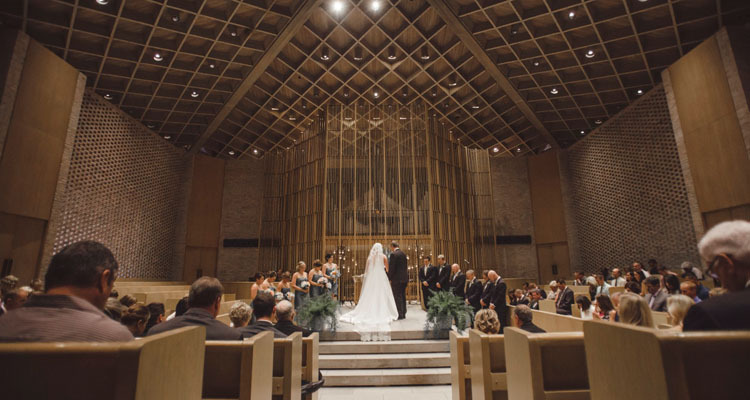 The ambiance of the chapel adds to the solemnity of a wedding ceremony. It is used by alumni, enrolled, and faculty of any Christian Denominations. It doubles up as both a reception and ceremony facility. 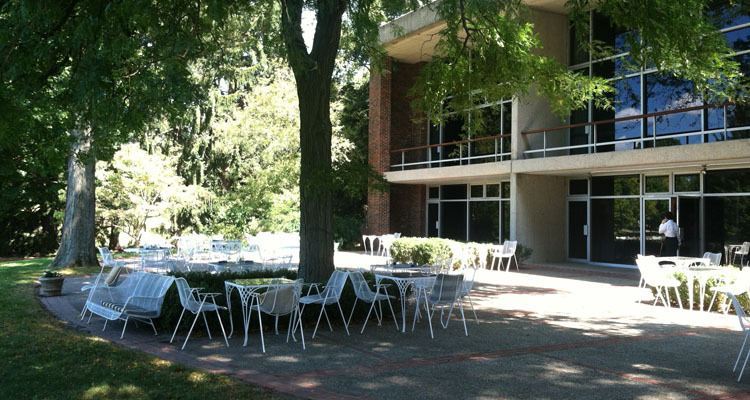 The Michigan League on the beautifully wooded Michigan campus is the premier place to hold seminars, conferences, and receptions, serving the University as well as the community. It was built to be a “building that would become a center for women’s social, cultural and recreational activities on campus.” It serves as a facility for ceremonies and receptions of all faiths and orientations without regard to affiliation with the University. Battel Chapel was finished in 1876 in the High Victorian Gothic style of rough brown sandstone. As the chapel was one of the stops on the Connecticut Freedom Trail, it features an exhibition depicting aid given to Amistad Africans by members of the Yale Divinity School. The Chapel is open for ceremonies to associates of the University and members of the New Haven community. Though ceremonies should have a religious aspect, there are few restrictions on denomination. 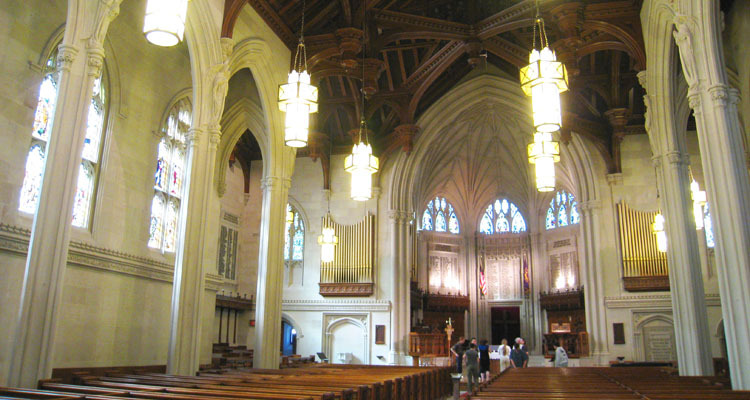 The chapel was a gift of German-American Henry John Heinz, founder of the H.J. Heinz Company. Its form is that of a modified cruciform plan: stone vaults, high ceilings, repeated arches, and extensive use of glass that were typical of American academic and religious architecture of this period. The Chapel’s walls, inside and out, are of Indiana Limestone. It offers its church for ceremony use only by the alumni, enrolled, and staff of the university, as well as employees of the H.J. Heinz Company, and immediate family, irrespective of faith. 28. 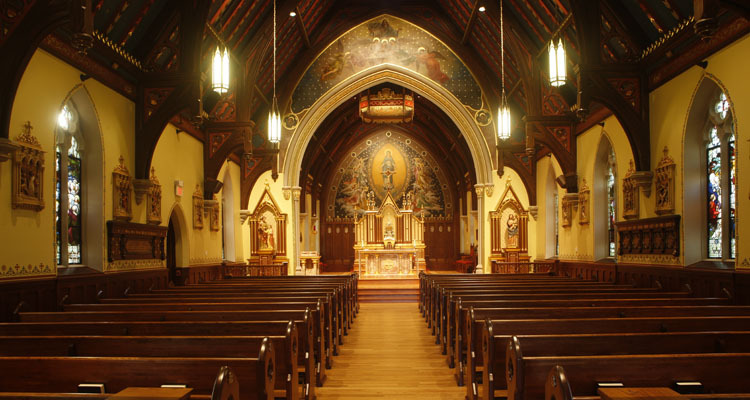 Chapel of the Immaculate Conception – Seton Hall University. The Chapel of the Immaculate Conception was built of local sandstone in the Gothic Revival style of the mid-nineteenth century. In size and design, it is similar to a medieval English village church. This intimate venue is used for Roman Catholic weddings only and doubles up as both a reception and ceremony venue. 26. Park/Solarium – Appalachian State University. The Summit Trail Solarium is intended for use primarily as a public gathering space for the diverse populations of the Appalachian campus. As such, the Solarium encourages an environment that promotes casual, non-structured usage, and the lively exchange of ideas through informal interactions among students, faculty and staff. It offers a hall and is open to be used by anyone no matter the denomination, faith or judge. It is solely used for ceremony purposes. 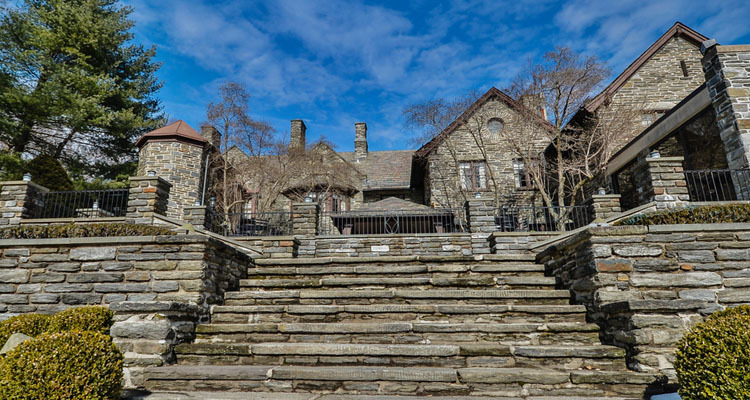 This circa-1914 stone mansion is beautiful inside, with grand architectural details, a dramatic staircase, Chippendale furniture, and outside, with 32 wooded- acres featuring ponds, gardens and sculptures. There is a blissful garden and a vast ballroom that is open to everyone irrespective of the denomination, faith or judge and is used solely for ceremonies. Perkins Chapel is a brick and stone version of a type of church built in New England in the 18th and 19th centuries, reflecting a Georgian style. Reflecting the wide use of color typical of Georgian architecture, the all-white interior has been replaced with eight shades of off-white, coupled with warm neutrals and cool grays. Gilded Corinthian capitals and dentil work highlight once-hidden architectural details and emphasize changes in plane and light throughout the room. 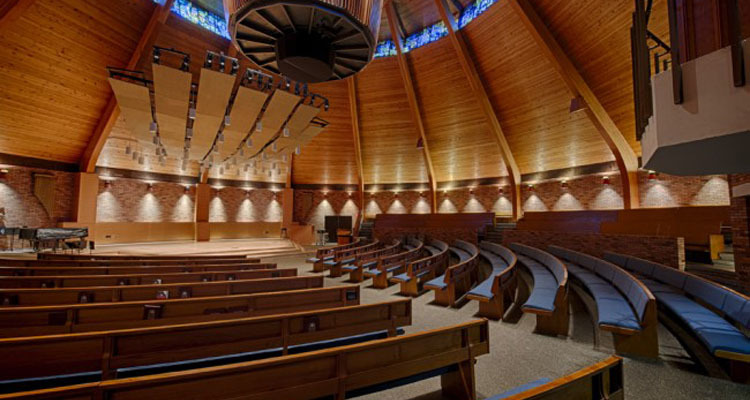 A computerized lighting system further emphasizes the coloration and volume of the chapel space. 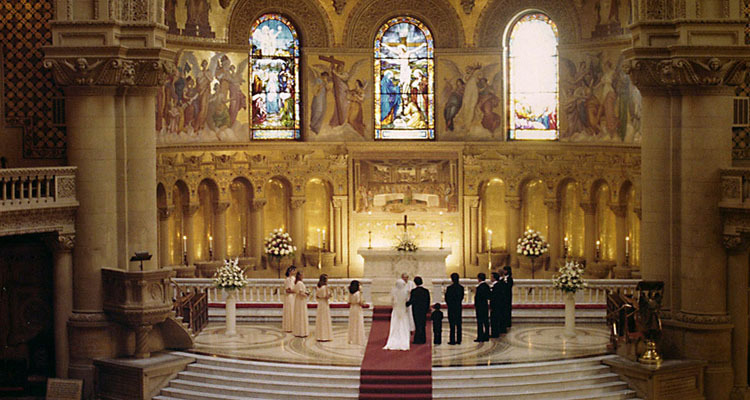 It offers the church and is open to the public for any Christian wedding ceremony. The masterpiece of Thompson Memorial is an 8-foot cross, designed and executed by H. Lee Hirsche, assistant professor of art. To the solid major axes of the cross, Mr. Hirsche welded thousands of bronze 2-inch rods at varying angles symbolic of the “crown of thorns.” The bronze rods “float” inside a black walnut frame which is in contact only with the back of the cross. The tower is a reproduction of St. Cuthbert’s tower at Wells in the southwest of England. It offers the church to be used by alumni, faculty and staff, and for Christian wedding ceremonies only. 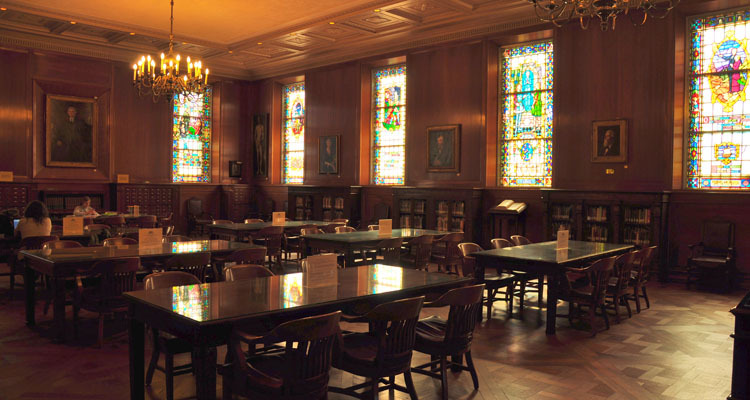 The University of Washington Club is a welcoming social club with a 105 year history of connecting the University community. Located on campus in an architectural landmark, and inspired by its collegiate atmosphere, the club provides a remarkable setting in which to socialize, dine and entertain. 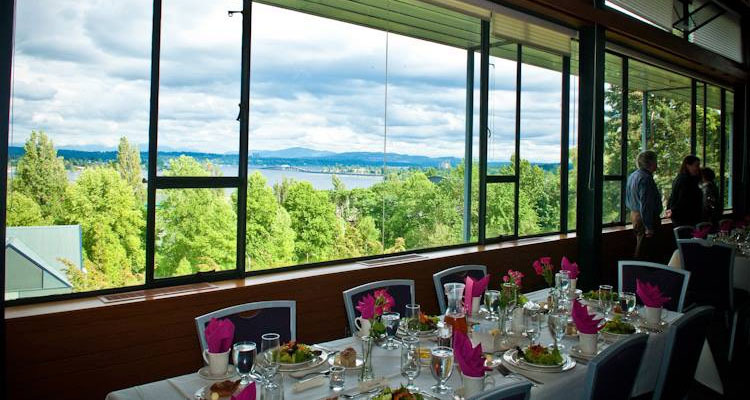 In this elegant wedding venue, you’ll have a beautiful view of Lake Washington; the perfect scenery for the perfect wedding day. Though it is the occasional host of a ceremony, it is mostly used for receptions and is open to everyone irrespective of denomination, faith or notary. As a major location for weddings in the North Shore, Misselwood offers a peculiarly beautiful and stunning setting for ceremonies and receptions. The ultimate wedding dream is fulfilled by the glorious grounds, walking paths, private lawns, and breathtaking views of the Atlantic Ocean. Guests will be amazed at the estate’s charm, the enchantment offered by the spectacular ocean vistas, and the beautifully landscaped courtyard. 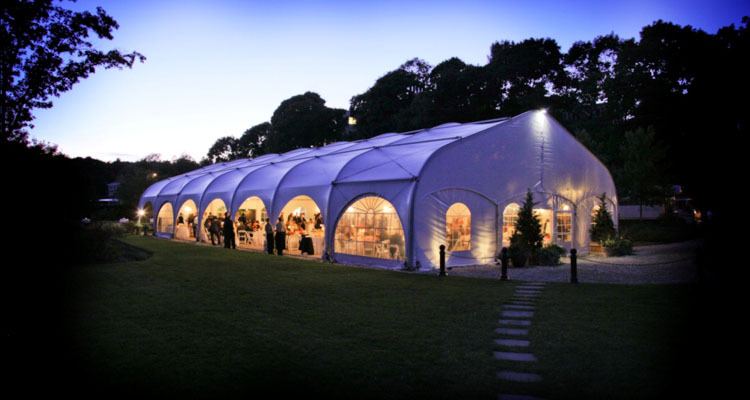 The seasonal tent boasts chandeliers, wall scones and a solid wooden dance floor. There are French doors which open out to a courtyard and patio surrounded by beautifully landscaped grounds. The most notable feature of the arboretum is its vastness and functionality. The facility sits on over 35 acres of land and boasts more than 17,000 single plants that represent over 700 different species. 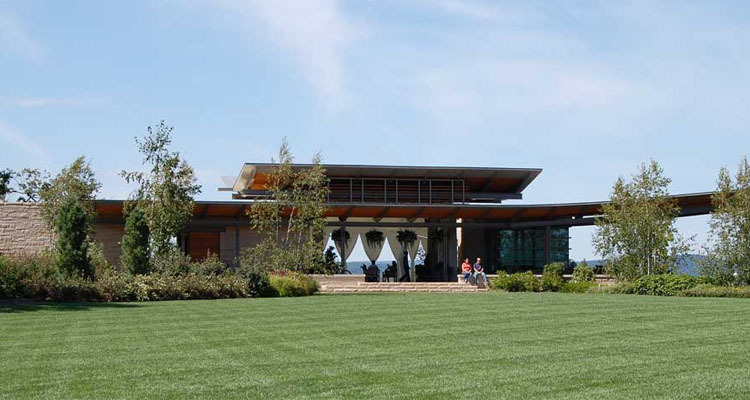 The Overlook Pavilion features spectacular views of central Pennsylvania’s rolling hills on one side, and views of the Penn State campus and the Margery Enes Smith Soaring Waters on the other. Being an outdoor facility, the arboretum is open to the general public and can host ceremonies from any denomination and faith. It offers only ceremonial rather than reception availability. This beautiful building commands a stunning vista overlooking the Pacific Ocean. Inside the chapel, against the brilliant stained glass backdrop and under the vaulted ceiling, couples seal their wedding vow. The view outside of the chapel is ideal for photography. The front window of the chapel faces south and is therefore evenly illuminated throughout the day. The chapel is situated on a hill that overlooks the Malibu Colony, the famous Malibu Pier and beach, and the small seaside community. On a clear day, Santa Monica and Palos Verdes are visible across Santa Monica Bay. 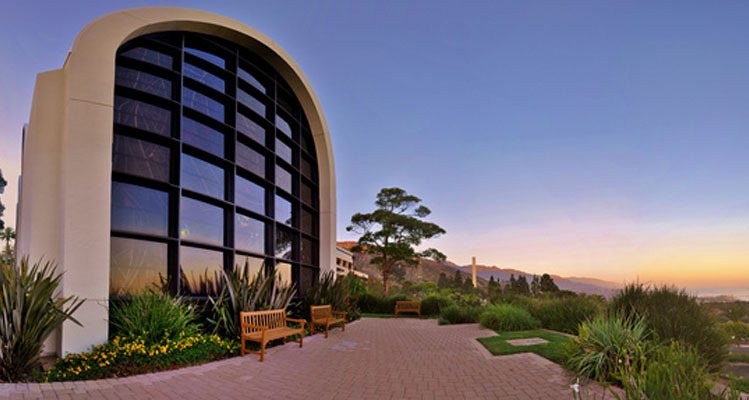 Above the chapel is the Pepperdine campus, nestled in the foothills of the Santa Monica Mountains. It offers the church to be used by alumni, enrolled students and staff for any Christian wedding ceremony. 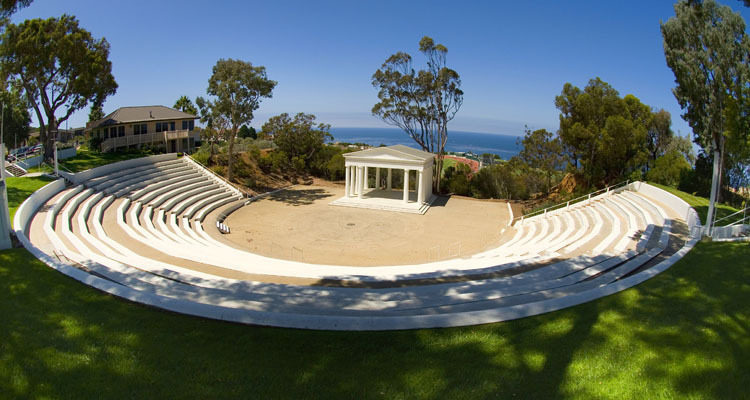 The Greek Amphitheater is the landmark of PLNU. With the white columns of the Grecian stoma standing tall beneath a grand eucalyptus tree and set against beautiful ocean views, it is a picture-perfect location for a wedding in any season. The semi-circle seats of this venue can hold up to 1,500 guests with room for 400 more on the ground level and is a great choice for ceremonies and receptions with natural acoustic benefits and convenient power outlets. The Bowdoin College Chapel is a beautifully contrived building in the classical English style. What could be more elegant? The chapel is free to be rented by the public for functions such as weddings, special occasions, and other formal ceremonies for a reasonable price. It can serve both as a reception and ceremony venue. To make the most of the Chapel’s surroundings, a fall wedding could be planned to coincide with the changing of the Maine foliage. 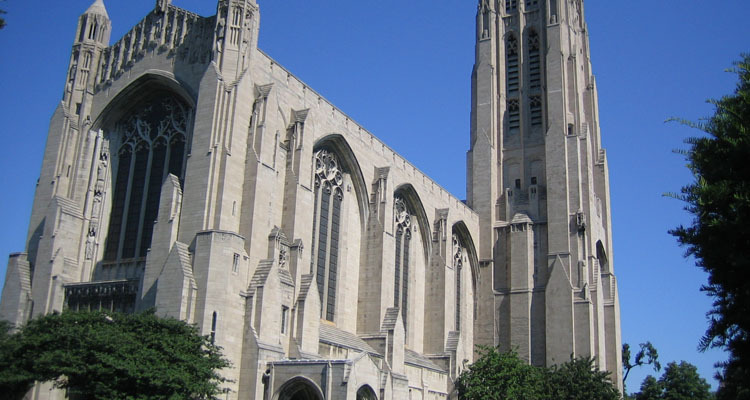 The tallest building on the campus of the University of Chicago in Chicago Illinois, Rockefeller chapel was designed by architect Bertram Goodhue between 1918 and 1924, and built between 1925 and 1928 without the use of structural steel. It contains about 70 integrated figural sculptures and interior mosaics. It offers the church to be used by alumni, enrolled students, and full time staff for receptions and ceremonies irrespective of the denomination, faith or judge. 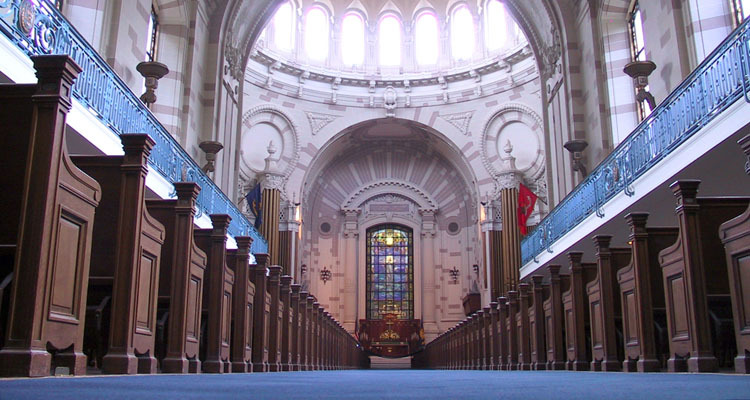 The Naval Academy Chapel was designated a National Historic Landmark in 1961. 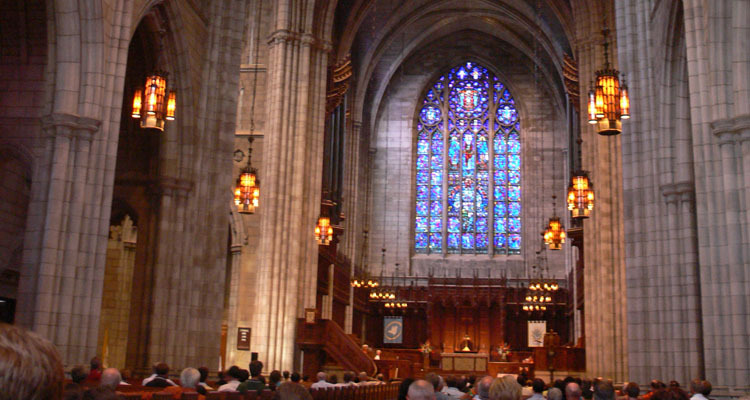 The two stained-glass windows facing the altar are symbolic. One is of Sir Galahad holding his sheathed sword, portraying the ideals of the naval service. The other signifies the Commission Invisible, a beacon each new officer must follow: Christ is pointing him toward the flag. The chapel is used for Christian & Jewish ceremonies only, and exclusively for alumni, students, staff, and active military living in the Annapolis area. The Chapel’s Collegiate Gothic design evokes an English church of the Middle Ages, although several aspects of it, including the vault and its supports, recall French churches. The chapel is cruciform and is built on the scale of a large parish church or a small cathedral. The only precedent for a university chapel of this size was King’s College Chapel, and only a small part of that chapel was used regularly. Exeter Cathedral and the Octagon tower of Ely Cathedral have been cited as precedents for the architectural detail. Chapel’s iconography consists of over 10,000 square feet of stained glass as well as stonework and wood carvings. It offers the church mainly to be used by alumni, students, and staff, for any ceremony no matter the denomination and faith with approval. Stanford’s Memorial Church is Romanesque in form and Byzantine in its details, inspired by churches in the region of Venice. Its stained glass windows and extensive mosaics are based on religious paintings the Stanfords admired in Europe. 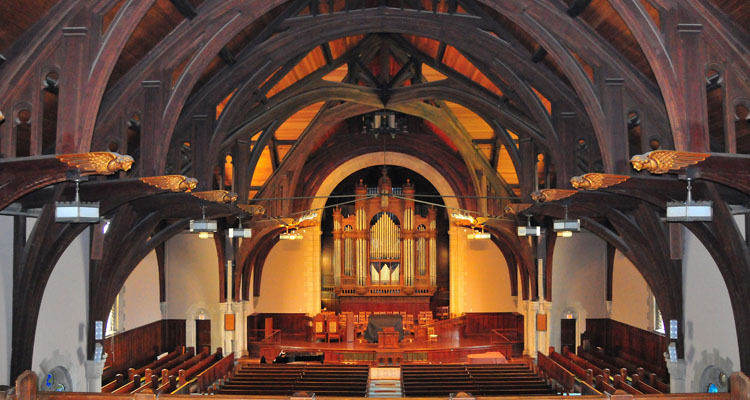 The church has five pipe organs, which allow musicians to produce many styles of music. It offers the church to alumni, students and staff for ceremonies of all faiths and denominations. Agnes Flanagan Chapel’s impressive contemporary lines and distinctive conical shape incorporate a strong Northwest Coast Native American influence. 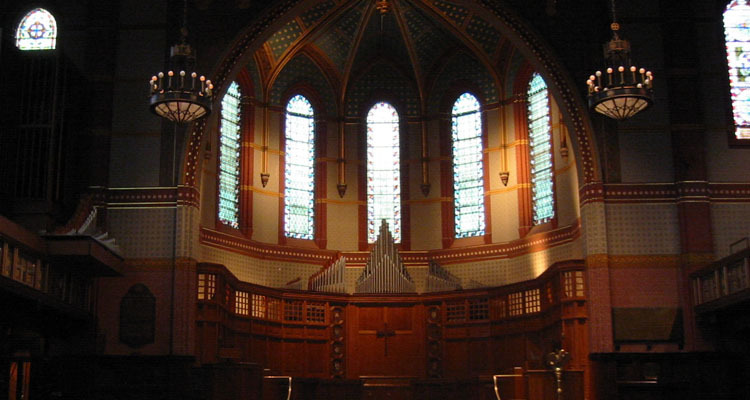 The beautiful interior of the chapel features a magnificent Casavant organ, seating for 460 people, and stained glass windows which depict the creation story as told in the book of Genesis; The Casavant organ has 85 ranks and most of the almost 5,000 pipes are suspended in the center of the chapel from the pinnacle of the ceiling. It is used for ceremonies and receptions. 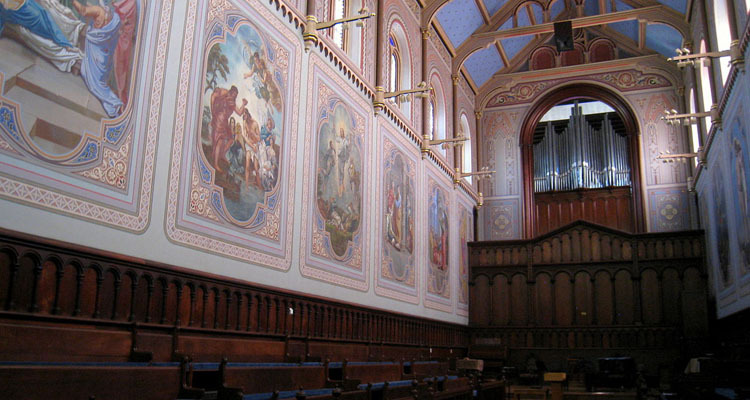 Sage Chapel in Cornell first opened its doors in 1875. The interior is decorated with a variety of colors and themes, all biblical allusions. In 1940 an expansion and renovation added space for a choir loft and room for the new pipe organ with 69 stops and just under 3900 speaking pipes. The building features stained glass windows courtesy of Tiffany’s. 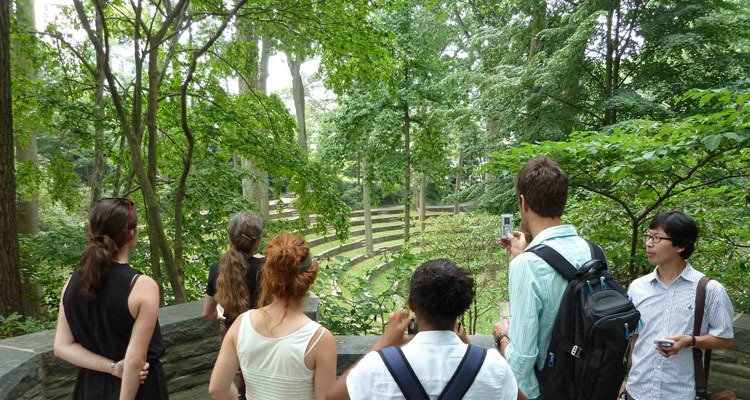 The Scott Arboretum Outdoor Amphitheatre is one of Swarthmore’s most dearly held spaces. The amphitheatre was designed by noted Philadelphia landscape architect Thomas W. Sears and the construction was completed in 1942. The roof is provided by the Tulip trees and white oaks. The outdoor setting provides all the required amenities for an outdoor ceremony. There are four stairways serving all seating and stage areas, which allows for a creative entrance. 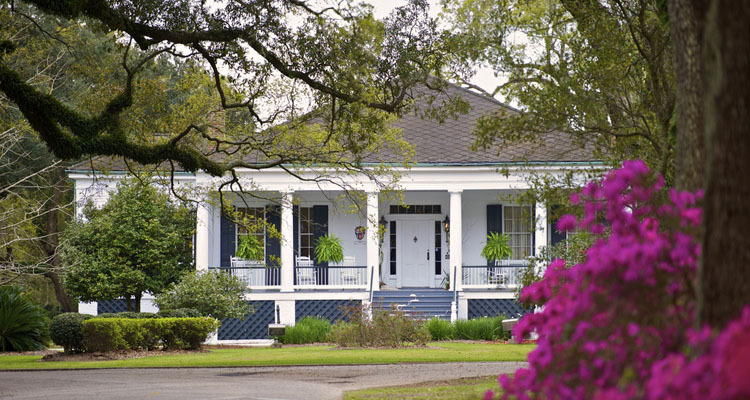 Resting on a lush green western edge of the Spring Hill College campus, Stewartfield is a Greek Revival raised cottage offering a captivating view of a major Mobile landmarks, the century-old Avenue of the Oaks. A long, spacious entrance hall welcomes guests inside the home and provides an appealing path of flow between the primary entertainment rooms at the front and rear of Stewartfield. A stately semi-circular ballroom at the rear comprises the largest formal dining and reception area inside the home. The ballroom features an assortment of period antiques including a massive square piano and portraits of religious leaders associated with the College. Outside is a beautifully landscaped patio, complete with iron tables and chairs and a decorative fountain. It has a ballroom and patio and is open to everyone no matter the denomination, faith or notary and doubles up as both a reception and ceremony facility. Janns Terrace, situated on the beautiful UCLA campus in the foothills of the Santa Monica mountains, is the perfect setting for an outdoor wedding. UCLA’s website suggests the intriguing possibility of a fountainside wedding underneath the stars on a warm California night. This venue is open to the public for all ceremonies. 7. 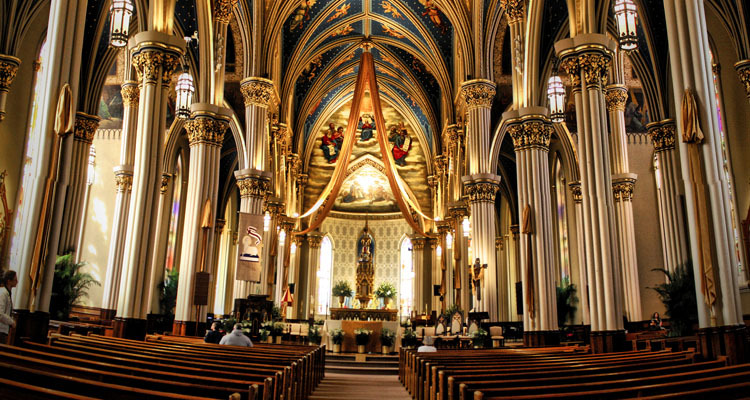 Basilica of the Sacred Heart – University of Notre Dame. Notre Dame’s Basilica of the Sacred Heart stands 218 feet, making it the tallest university chapel in America. 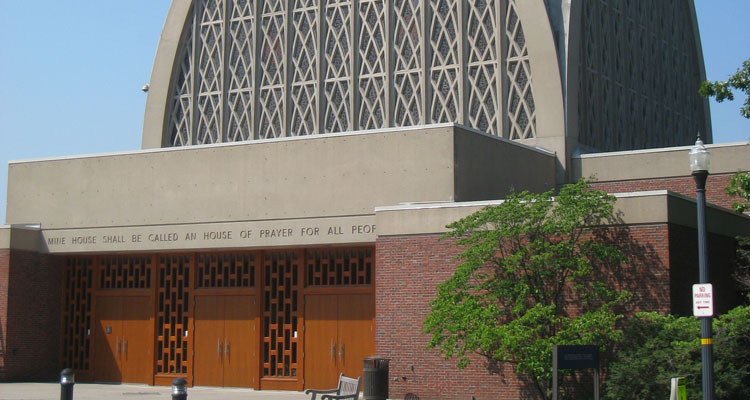 It’s Roman Catholic, also serving as the mother church of the Congregation of Holy Cross. The neo-gothic church has 44 large stained glass windows and murals completed over a 17-year period by the Vatican painter Luigi Gregorian. 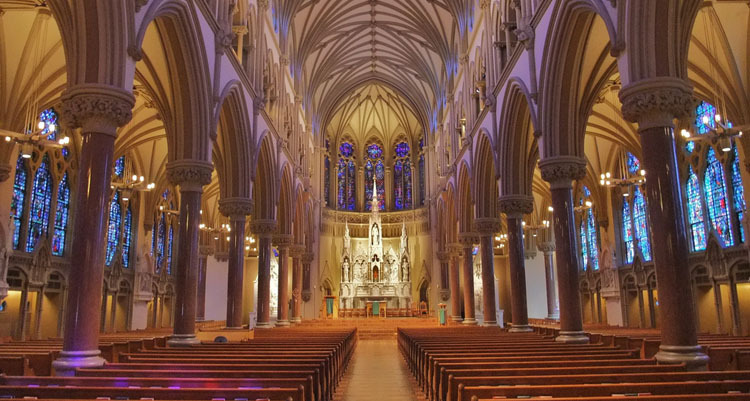 Often cited as the most beautiful church in the world, it is limited to use by alumni, students, staff, and member of the parish, for Roman Catholic wedding ceremonies only. Dedicated in 1874, this immense building is molded by monolithic wooden trusses, walnut paneling, and a blue, stenciled ceiling. 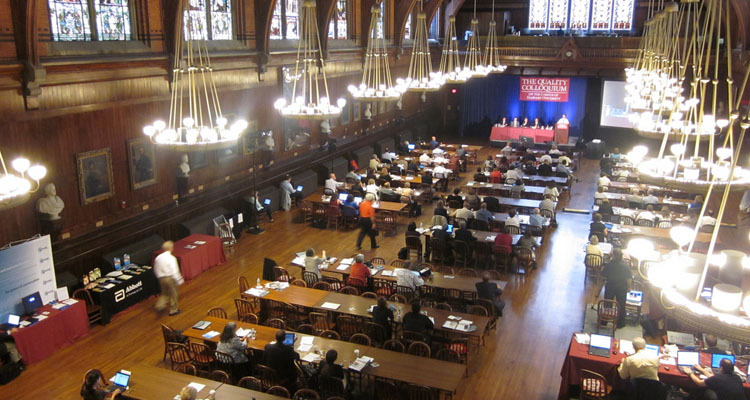 It was previously used by the Harvard Divinity students in winter for early morning calisthenics. Extensive renovations were made thereafter and in 1996 the quad was renamed to Annenberg Hall and replaced the freshmen dining hall. Your guests will never lack a place to sit and celebrate the big day with you. Richard Morris Hunt, the architect of Ochre Court, drew his inspiration for the mansion’s exterior from the late medieval period in French architecture. He installed high roofs, turrets, whimsical gargoyles and tall chimneys. The interior adapted the French Gothic chateaux and churches to create a great hall, ground floor reception rooms and private family rooms. 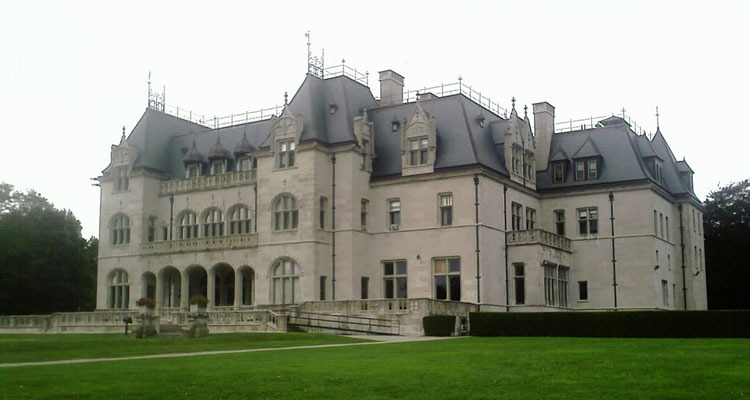 Ochre Court is consistently cited as one of the most beautiful mansions in Rhode Island, and is open to the public for wedding receptions and ceremonies. 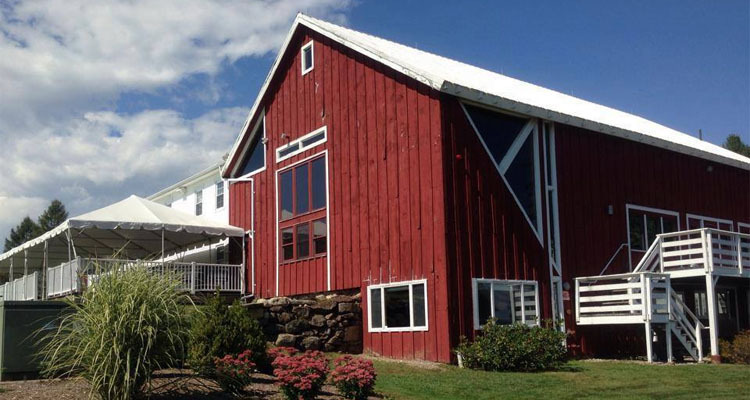 Red Barn showcases awe-inspiring scenes of the Notch and the Holyoke Mountain Range. Along with room for 120 guests and a dance floor inside, the large deck provides additional space for an outdoor cocktail hour with a scenic backdrop. For parties with 80 or fewer guests the ceremony can even be held on the deck. The ceremonies can also be held in front of the large oak tree during spring, summer or fall months. The hall is open to everyone and ceremonies can be of any denomination and faith. It’s suitable for both hall and reception activities. 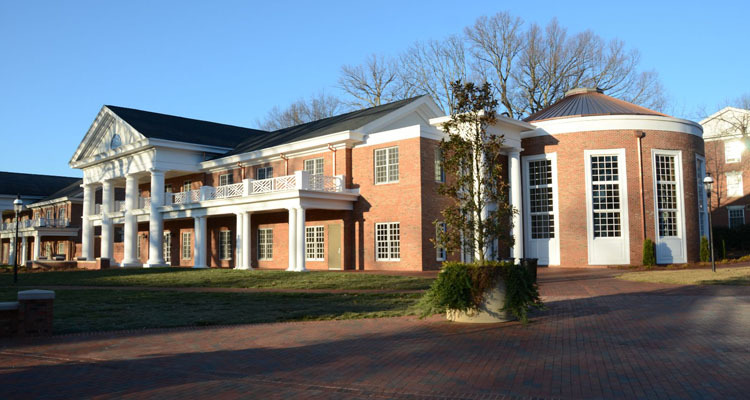 The Baughman center is made up of two buildings: the 1500 square foot pavilion and the 1000 square foot administrative building. In its vastness and beauty, it stands as a dazzling, graceful reflection of the University of Florida campus. Contrived to impart the colorful outdoor setting inside, the towering windows and lifelike materials echo the serene Florida surroundings. From the travertine marble floors to the hardwood paneled roof, it ranks as one of the most beautiful and peaceful places in Gainesville. The university accepts all kinds of weddings irrespective of the person’s affiliations to the University, faith or cultural beliefs. St. Francis Xavier is one of the most beautiful churches in the world, let alone on a college campus. Wedding events are incredible and very reasonably priced: An all inclusive ceremony and reception at the attached Xavier Grand Ballroom costs a flat $2300. It is open to the public, but couples must be baptized Roman Catholics. Completed in 1962, the building is the most distinctive feature of the Cadet Area at the United States Air Force Academy north of Colorado Springs. The panoramic chapel features a row of seventeen spires. The 10,000 sqaure foot area of worship is located on the main floor can accommodate a congregation of about 1200 people. Tetrahedrons make up the walls and the elevated ceiling of the chapel. 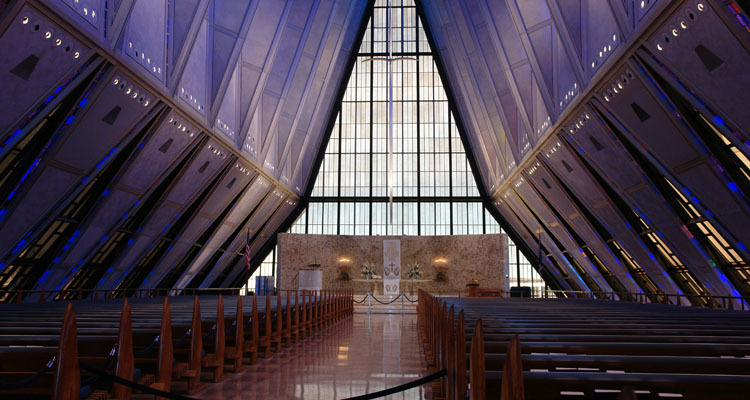 Varnished glass windows provide palms of color between the tetrahedrons, and grade from darker to lighter as they approach the altar. The surrounding views of the Rocky Mountains add to the majesty of this location.